During my first visit in Yellowstone it wasn’t hard to find wildlife… at least not for me. I saw everything from Eagles to grizzly bears. This particular morning near Lamar Valley, I pulled over at a lookout spot where dozens of people with spotting scopes trying to find the majestic Yellowstone wolves. The group had gazed over Lamar Valley the past 3 mornings with no lucky of spotting a wolf. I decided to hike back down the road 1/4 mile to where I saw an Eagle sitting in a nest. I had to venture off into the field so I could get closer for a decent shot when I felt a force over my shoulder. 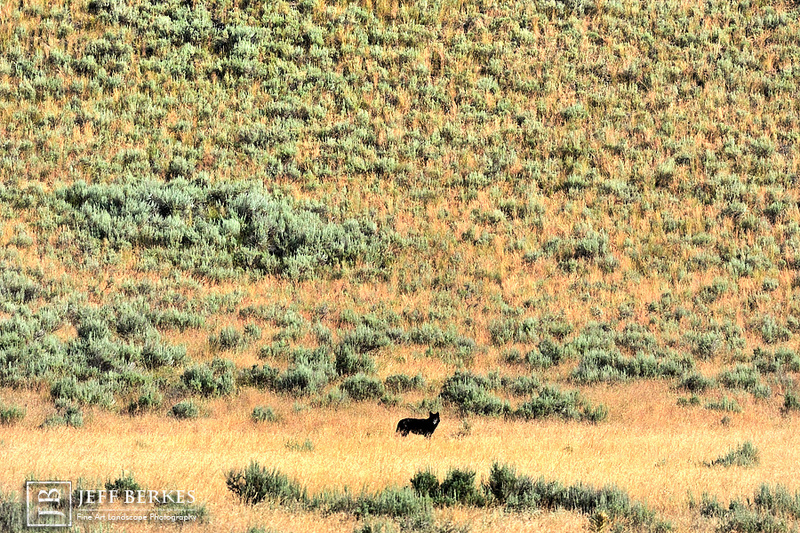 I turned around and saw a black wolf jogging over the hill to my right. I instantly stopped dead in my tracks and focused all of my attention on this wolf running right at me. I quickly realized I am 1/4 mile away from my car with a full-grown wolf, 300 feet away. The only thing I could think of was to keep taking pictures, and so I did just that. At about 190ft, the wolf stopped and stared at me for several seconds sniffing the air. He posed for another 20 seconds, turned around and left. It was a wonderful experience out in the wild with a black wolf, and live to tell about it. I had nowhere to run and nowhere to hide, it was one wildlife encounter I will think about forever.